World Environment Day – Gone wild!! 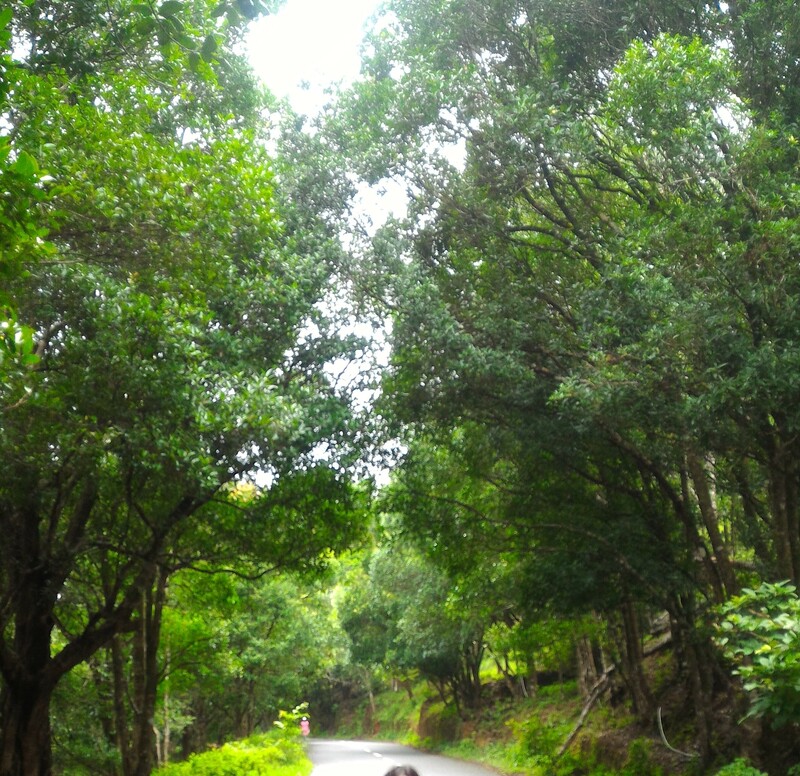 On this June 5 – World Environment Day, the Kerala Forest Department along with WWF India organized a rain walk from Kallar to Ponmudi, a hill-station located at a distance of 61 kms from Trivandrum. Luckily, as it was a Sunday me and my friends decided to go on this trip, though we don’t know whether it rains or not. We chose the route to Nedumangad-Anad-Vithura-Kallar. We set on our bikes around 6.15 hrs in the morning from Trivandrum to Kallar (42 kms). 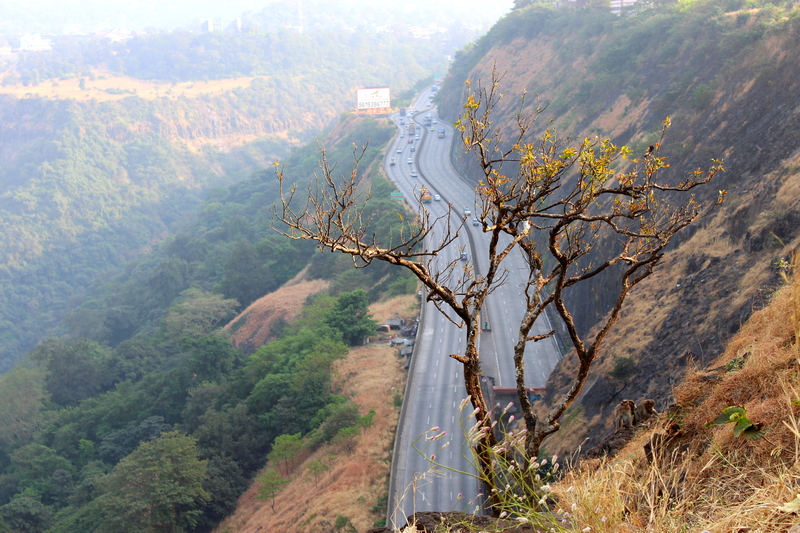 Truly an adventurous and thrilling drive as the roads were pretty narrow and curvy. And the lush green surroundings full of rubber plantations and coconut grooves, along with the early morning breeze enhanced its charm. As this is my first drive on a bike in Kerala, and has no experience on such roads, I struggled a bit at the beginning, but soon caught up my speed. We reached Kallar around 7.30 hrs. Quickly completed the process of registration, and watched around to see our group which comprised of some 35 people from different age groups (youngest – 11 yrs and oldest – 60 yrs). I was quite excited. The WWF representatives and the Forest Division Officer, Kerala Forest Dept gave us a quick introduction to the World Environment Day and its theme this year. Once done, they flagged off the walk around 8.00 hrs. 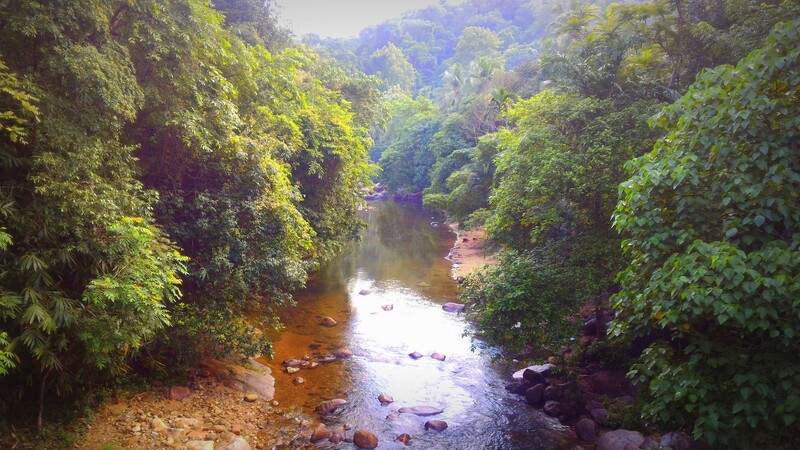 The first one to welcome us is the Kallar river, after which the place Kallar has been named. A bird watching spot. There is the Meenmutti waterfall nearby, but didn’t get a chance to visit it this time :(. This is solely a road trek as they are very much concerned about our safety, but still got good chance of trying the off roads wherever possible. 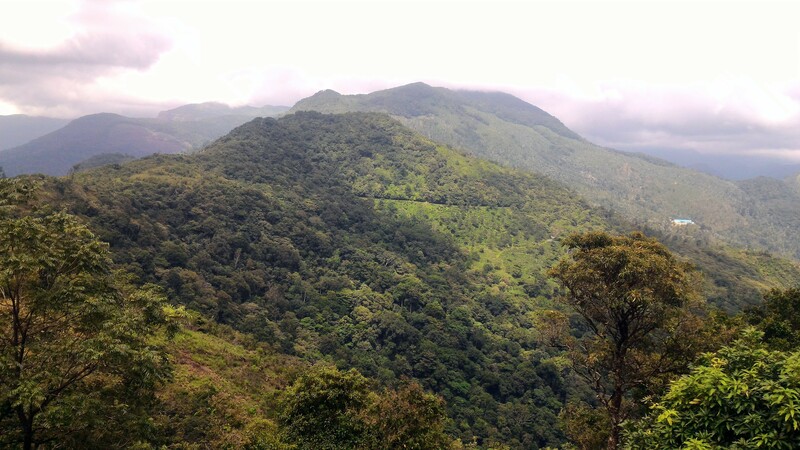 Ponmudi is situated at about 3000 feet and is home to mountain flowers, butterflies, spiders, springs and rivulets. 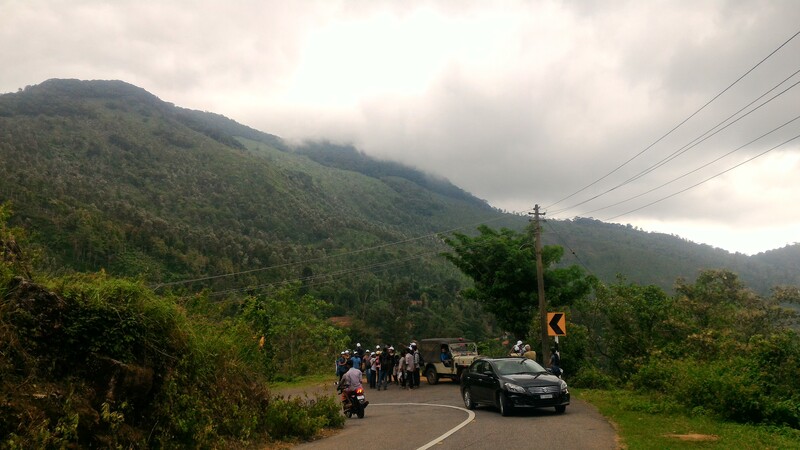 The way from Kallar to Ponmudi comprises of 22 hairpin bends, probably one of the highest compared with rest of the hill stations in Kerala. The foothills of Ponmudi has few rubber plantations and I was lucky enough to see how the trees secret the latex and how it is being collected in the coconut shells or polythenes that were tied around the trees. The thing which attracted me the most is the down-hill view. It was almost as if the Mother Earth is wrapped up in a thick blanket of lush-green trees and forests. 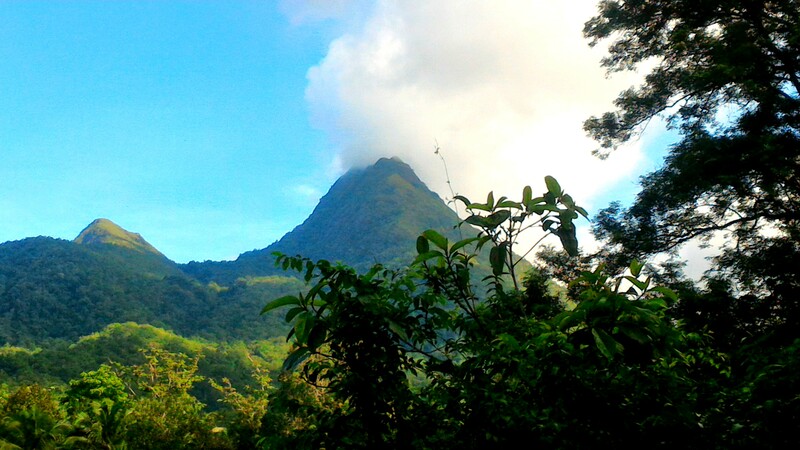 The cloud-kissed mountains, hills with tea plantations, mountain flowers on the road-sides and giant spiders and web right beside the trees, neat and clean roads, the green canopy, sun-rays playing hide and seek, it is simply one-hell of a beauty! Though the first few kms of distance was tiring, coz of the hot sun, it started to rain in mid-way and all of a sudden the climate changed into a pretty cool one. 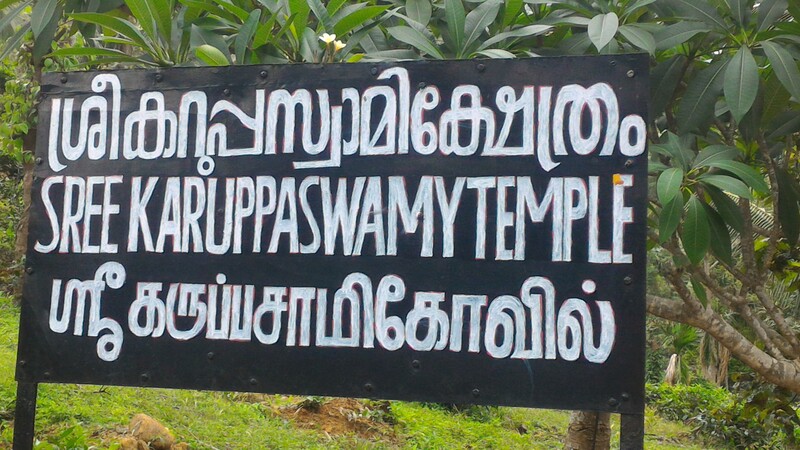 There was a temple dedicated to Karuppaswamy, a friend of Lord Ayyappa, a tea factory and a PWD Guest House on the way up. Though it’s a road trek, we tried the off-road ways at the hairpin bends, and trekking through the tea-gardens wherever there were possibilities. It took us around 4 hours (around 13.00 hrs) to reach till the Government Guest House located on top of this hill. We had a good Saadhya (Malayali Lunch), which consisted of the local variety of rice, Aviyal (mix veg curry), Poriyal (a fried stuff), Sambar and the Pepper Rasam with a Papa, provided by the staff there. About 53 kms from Trivandrum and 7 kms from Varkala, Kappil beach is one of the most picturesque destinations of Kerala. 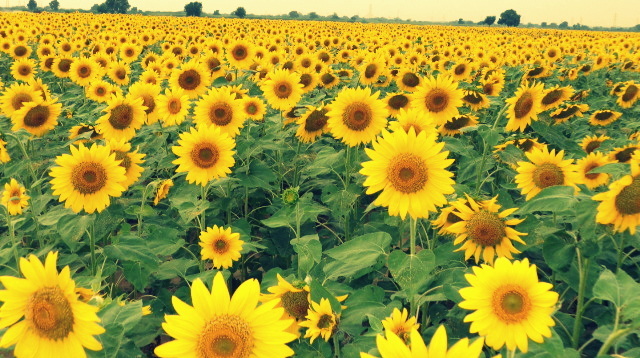 It is not just another tourist spot, but a must visit place. On the west is the true blue Arabian Sea and the east is Edava Narayan Lake. 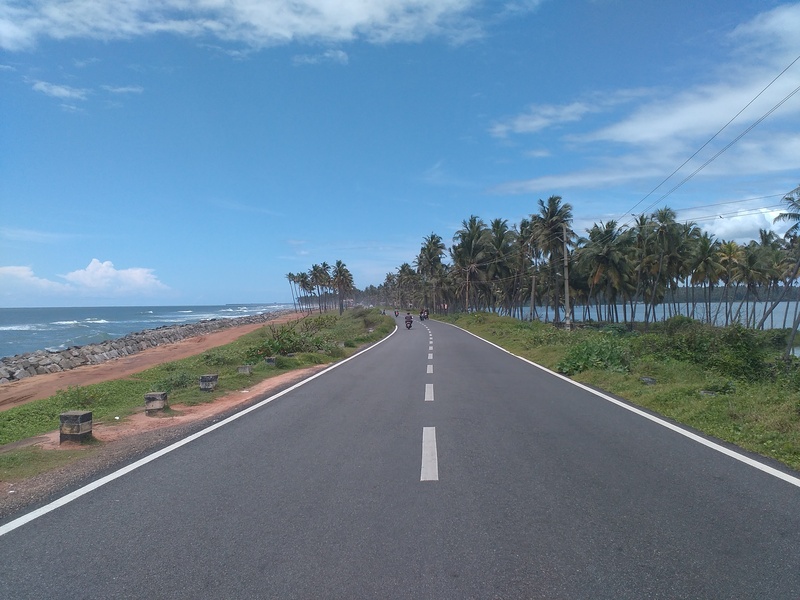 The true confluence of backwaters and sea with some lush green coconut grooves.. Road runs as such for about 1 km. Kappil has its own fishing community, and the true fun is the backwater ride. Situated about 12 km south of Varkala. Have to board a country boat from Neduganda and take a tour through the backwaters for about 30 minutes to reach Ponnumthuruthu. Ponnumthuruthu, the name literally means Golden Island. This lush island is a perfect gateway for those who seek a break from the hustle and bustle of the urban life. This island is known for the Shiva Parvathi temple, which is more than 100 years old. A royal family owns the island and the temple. Probably one of the least explored places in India. Situated on the rivers of Pennar, in the Kadapa district of Andhra Pradesh, and is one of the best places in India. Truly an equivalent to the Grand Canyon. Gandikota derives its name from two Telugu words, “Gandi” meaning gorge and “Kota” meaning fort. But, why this name? Coz, the river Penna forms a Gorge in this tiny village and there is a fort just on the river side, which is believed to have been built during the later half of the 13th century. # Gandikota (Gorge Fort): It is a stone fort built upon a bill. 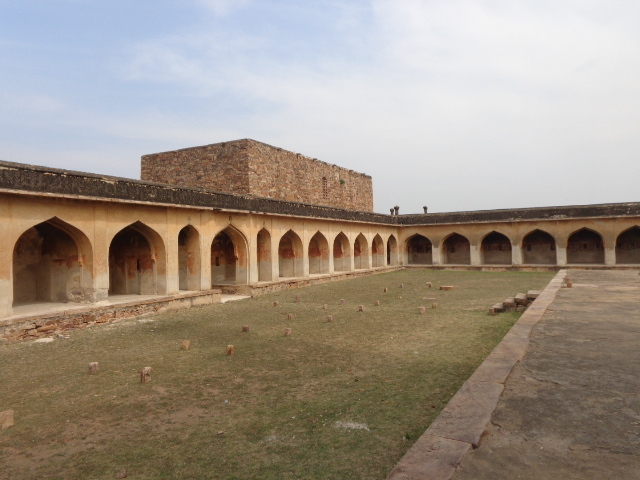 Guarded by a huge entrance gate that is some 20 feet high and 101 bastions each over 40 feet high, it still remains a very imposing structure. Believed to have been built during the later half of the 13th century AD. Gandikota impressed the French traveler Tavernier, so much that he opined that it resembles Hampi, Vijayanagara in its massive monuments. And the Mukhadwara (entrance) of this fort welcomes us to enter the Gandikota village. # Ranganatha Swamy Temple: On walking a further from the granary, one can find this temple. The temple is not in a good condition, yet people from the nearby villages come here to offer prayers to the Lord Ranganatha (Vishnu). The temple is located on an elevated platform. But the art on the temple walls has not lost its sheen. # Pennar Gorge: A few steps further from the Ranganathaswamy temple, there lies thousands of rocks, small and big. Trust me, there won’t be a trace of what you are searching for. One has to take the pain of climbing up and down those rocks carefully, keep a watch on the surroundings and on their own footsteps and hunt for the treasure. 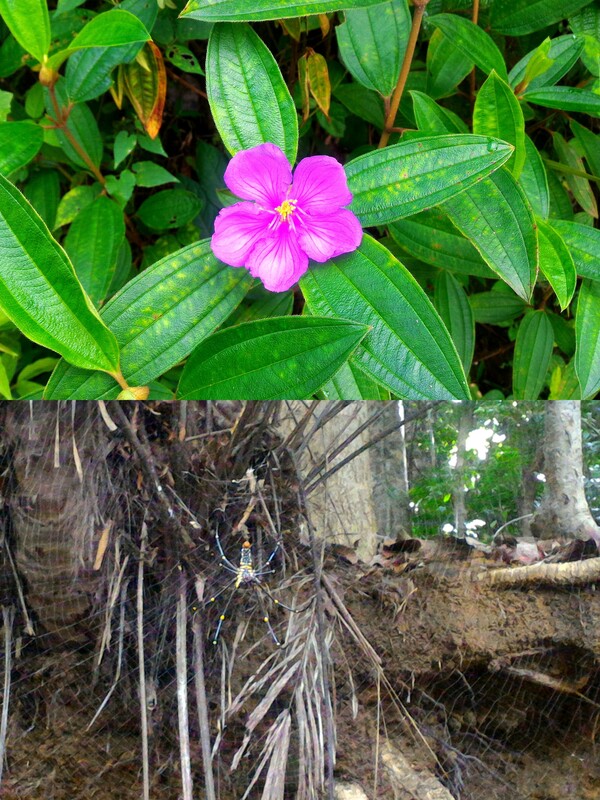 After few minutes, one will find the treasure of nature’s beauty. The awesome Pennar Gorge. Stacks of rocks arranged in a perfect manner as if it was a book shelf, a mighty gorge and the river Pennar flowing through it. The beauty was beyond description. It just needs to be captured by one’s own heart and soul. # Madhavaraya Temple: While all the above mentioned places are on side, this temple is on the other side. It takes some time to reach this place from the gorge. This is probably the biggest structure among all the ones present in this village. The main sanctum of this temple is also elevated and there are good number of mandapas surrounding this temple. Truly a majestic structure. Kadapa is well connected with the major cities like Hyderabad, Vijayawada and Bangalore by road. One can reach either Proddatur or Jammalamadugu and from there can catch an auto or a cab to drive to Gandikota. And the drive will be smooth as the condition of the roads is too good. A special thanks to my friend Ruthwik for suggesting me to pay a visit to this place and to my loving brother Vijay for joining me in this beautiful journey.